Budva Paragliding Montenegro - Flying Adventure! Realize your dreams of the best active holiday in Montenegro! Fill your journey with unique sensations and unforgettable impressions! Paraglider is ultralight aircraft that can embodiment your dreams and provide a lot of positive emotions and great impressions. Tandem flights with masters of Budva Paragliding Montenegro are comfortable and absolutely safe, will present you with a lot of unique sensations and joyful impressions! Together with Budva Paragliding make your adventures at any time of the year, Montenegro is the best place for this! Choose & book your paragliding adventure now! With us everyone can fly and try paragliding! As a passenger, you do not need any prior knowledge or experience of flying, whether young or in years (the oldest passenger is 93), light or heavy (25-120 kg). Minimally you will need - strong shoes such as sneakers and a jacket depending on the season, as well as sunglasses. Even the youngest can make a paraglider flight. We fly with children from 3 years using special equipment. With us, you can also make a magnificent unforgettable flight in winter. We start from the top of mountain above the beach. We run up to ten meters and glider comes off gently from the ground and … we fly! Nothing could be easier. You as a passenger have to do nothing! Just lift your legs and we land softly on the ground. Due to competence, experience and sense of responsibility, we guarantee maximum safety. We have been flying since 1993 and are the pioneers of Paragliding Montenegro. Our pilots have more than 15 years experience of flights in tandem with countless passenger flights and flight hours. CHOOSE & BOOK YOUR FLYING ADVENTURE NOW! 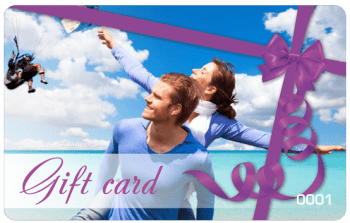 A colorful gift card is a great gift for all occasions! The card is for the presenter, with no time limit for use. The card can be activated by the lucky owner at any convenient moment.